We are finally starting to get some nice weather around here and this weekend was gorgeous. 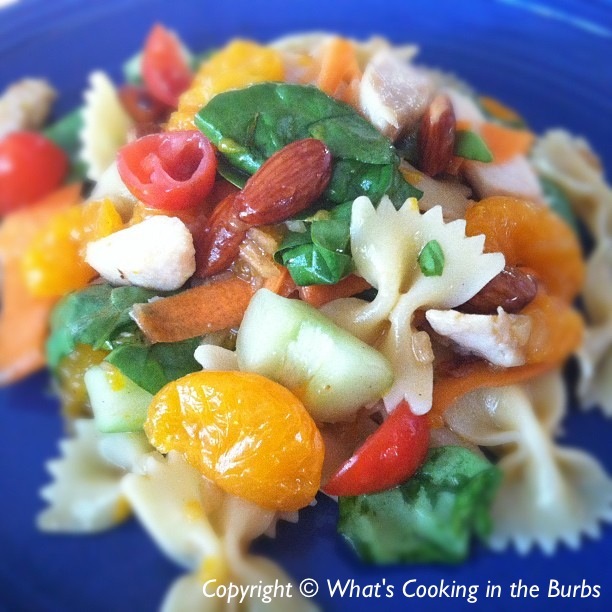 The warm weather has me in the mood to make summery dishes and this Mandarin Chicken Pasta Salad makes a perfect lunch or light dinner. It is one of our favorite meals. We served this with some warm french bread and it made a delicious dinner. To make the dressing whisk together the rice vinegar, orange juice, sesame oil, vegetable oil, onion soup mix, sugar, and garlic until well blended. Cover, and refrigerate until needed. Meanwhile, bring a large pot of lightly salted water to a boil. Add the pasta and cook for 8-10 minutes or until al dente, drain, and rinse under cold water. Place pasta in large bowl. To make the salad, toss the cucumber, tomatoes, carrot, spinach, mandarin oranges, chicken, and almonds with the pasta. Pour the dressing over the salad mixture and toss to coat evenly. Serve Immediately. Enjoy! This looks really good. I love anything with mandarin oranges. Pinning! Pasta salads are so good. This will be a hit at my house! Thanks for sharing the idea. Hope you can bring this over to What'd You Do This Weekend at Tumbleweed Contessa's kitchen. This looks delicious and my entire family will do battle over the oranges! Thanks for sharing this week @ Monday Funday! I love pasta salads and this looks so yum!! Thanks for sharing! Thanks for bringing this over to What'd You Do This Weekend? Love it. Pinned and making this. Sounds very good! My little girl loves mandarin oranges and pasta! So this will be a hit for sure! wow, looks delicious and the recipe seems easy enough. will try it soon. Another delicious recipe. I can't wait to try it, with that pop of sweetness from the oranges!